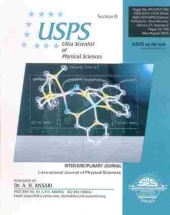 International Journal of Physical Sciences - (JUSPS- B) (Physics, Geology, Engineering, Bio Sciences, Management, Chemistry, Computer & Info Tech) The Journal of Ultra Scientist of Physical Sciences is approved by UGC (Sr No. 44588) / (Sr No. 47046). The old ISSN of JUSPS was 0970-9150.The International Journal of Physical Sciences (JUSPS-B) has Impact Factor is now 2.90 for the year 2016 and for 2015 it was 2.85.The periodicity of international journal of physical sciences is monthly from July 2016. The Journal of Ultra Scientist of Physical Sciences Section B publishes papers in Pure & Applied Physics, Engineering Physics, Astrophysics, Atmospheric and Space physics; Atomic & Molecular Physics; Biophysics; Condensed Matter & Materials Physics; General & Interdisciplinary Physics; Nonlinear dynamics & Complex Systems; Nuclear Physics; Optics and Spectroscopy; Particle Physics; Plasma Physics; Relativity & Cosmology; Statistical Physics,Nuclear physics, Optics and optical physics , Energy, Geophysics , Nano Physics & Nano Technology , Bio Medical engineering , Mechanical Engineering Electronics and Communication Engineering, Aerospace engineering, Civil Engineering, Electrical Engineering , Mechatronics Engineering, Industrial Engineering, Operations Research, Management, Economics, Geology, Agriculture, Education and all allied engineering branches and interdisciplinary subjects are also welcome for publication.